Jehmel Alexander stands in a spotless, state-of-the-art kitchen mixing a huge bowl of freshly chopped broccoli, peas, and carrots with rice and beef. The meal will be one of 5,000 that Foodlink, one of the nation’s oldest food banks, prepares for children in Rochester, New York, every weekday. Before earning a spot in the career fellowship, Alexander worked as a busboy at an Olive Garden franchise. Four of his fellow classmates, who range in age from 18 to 50, were employed at fast-food establishments, four were on public assistance, and the rest were on parole or recovering from substance abuse. The launch of the fellowship coincides with Foodlink’s 40th anniversary, and marks a new chapter in the nonprofit’s expansion in Rochester. The food bank, founded by Tom Ferraro in 1978 (who served on the board of the nonprofit Second Harvest, which eventually became Feeding America), has grown to a 500-member organization that currently distributes more than 18 million pounds of emergency food—including nearly 5 million pounds of produce—to human services agencies, food pantries, senior centers, after-school programs, and daycares in 10 counties. Foodlink also runs more than 30 programs aimed at ending hunger and improving nutrition, like its Curbside Market trucks, which deliver low-cost fresh fruit and vegetables to about 30,000 customers. Foodlink also operates a 1.3-acre farm in northwest Rochester, where refugees from Nepal, Bhutan, and Somalia grow about 5,000 pounds of food annually for other Foodlink programs and to feed their families. Creating a culinary program is one dream that Ferraro, who died of pancreatic cancer in 2014, didn’t live to see fulfilled. His staff committed to making it a reality. At the same time, Wegmans Food Markets, also headquartered in Rochester, was having difficulty filling mid-level cook positions, and urged the food bank to expedite the process, which kicked off two years of planning. 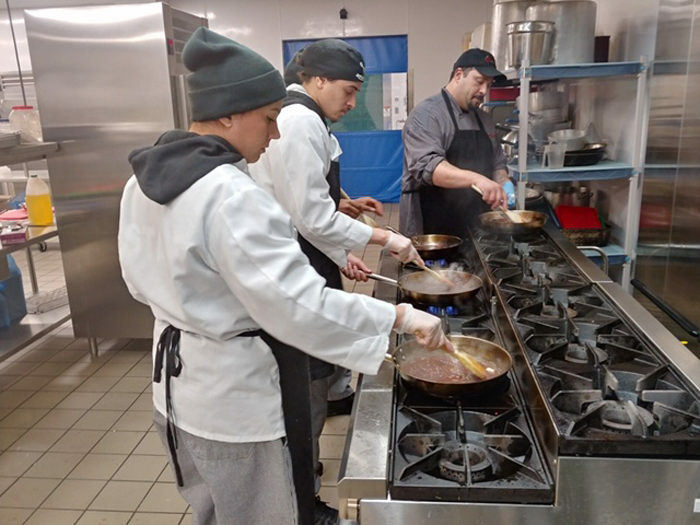 And with the launch of the career fellowship in July 2018, Foodlink has joined a large cohort of programs across the country—from Wisconsin to San Diego and from Oregon to New York—that are meeting the strong demand for skilled kitchen labor by training the formerly incarcerated and economically disadvantaged. As part of their research, Foodlink staff visited DC Central Kitchen and L.A. Kitchen (which closed last month), two of the 60 members of Catalyst Kitchens, a Seattle-based organization that helps nonprofit organizations expand or grow food-service businesses and culinary job training programs geared to the homeless and formerly incarcerated. 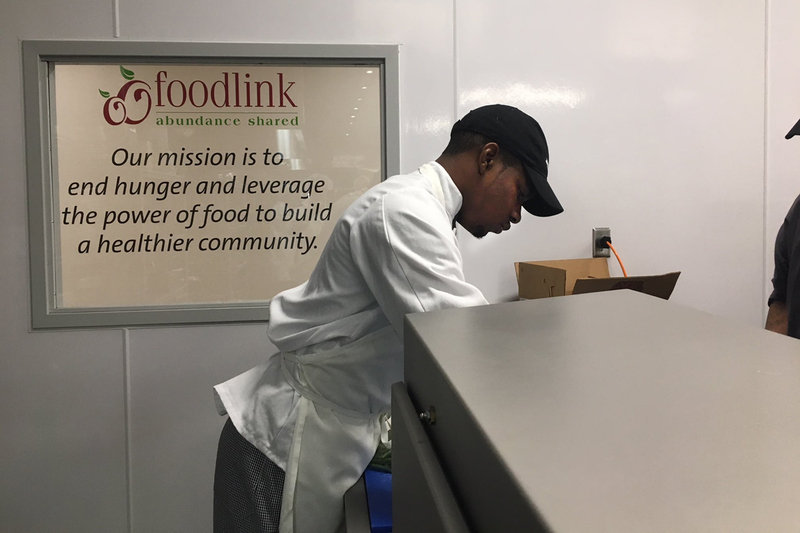 Foodlink staff learned that successful programs offer workplace readiness skills and customized, attainable career pathways, training kitchens modeled after real work environments, and access to job placement and retention support. Foodlink also hired Catalyst Consulting, an arm of Catalyst Kitchens, to conduct a feasibility study. A pasta demo in the Foodlink kitchen. Locally, Foodlink staff met with business leaders in food sales and production to learn about their employment needs. The bottom line: there were more jobs than qualified mid-level cooks. “If we are successful in training people for the jobs that exist in Rochester’s food industry, we can continue to scale up the fellowship to meet the demand,” says Gruber. For those who graduate, the future looks promising. 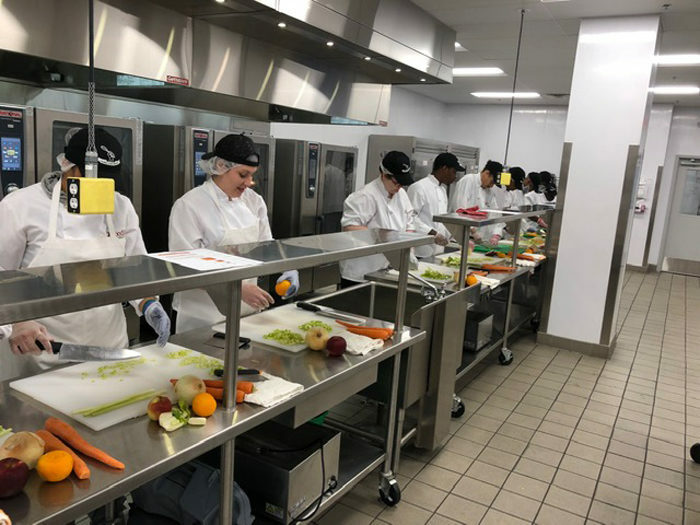 In addition to Wegmans, other major regional employers—including Barilla Pasta, LiDestri Foods, the University of Rochester, and the Rochester Institute of Technology—are experiencing difficulty finding skilled mid-level cooks. There is a nationwide shortage of mid-level cooks, which is likely to worsen, even as demand increases: According to the U.S. Bureau of Labor and Statistics, demand for cooks projected to rise 6 percent by 2026. Foodlink fellowship’s pilot year cost about $360,000, funded by Foodlink and three local foundations. The food bank’s reputation for creating and maintaining programs that effectively address the root causes of hunger—and its financial stability—gave community funders and partners the confidence to support and engage with the new program, says Gruber. Wegmans’ strong support was also vital to developing the culinary program, he adds. In 2016, the supermarket giant helped design and pay for Foodlink’s $5 million, 28,000-square-foot kitchen, built at the nonprofit’s headquarters on the northwest side of the city. Wegmans staff advised Foodlink on the purchase of kitchen equipment and curriculum development and, most importantly, Wegmans committed to providing externships to the fellows during their final three months in the program. The supermarket chain will consider successful interns for full-time employment. Foodlink is committed to helping those who are not hired by Wegmans find positions with other local companies, staff say. The students spend 90 minutes a day in the classroom learning Rouxbe, a web-based culinary curriculum used by Wegmans, Marriott International, and other professional kitchens. The rest of their time is spent in the kitchen, making lunches in the cold room, working on an assembly line, slicing apples for school snack bags, and preparing hot meals in the kitchen. Foodlink cooks teach the students food safety, knife skills, food prep, kitchen cleaning, and teamwork. Foodlink’s positive impact has not gone unnoticed; as the nonprofit celebrated its 40th anniversary in December, it received a $481,000 grant from the USDA to expand its Curbside Market, and $20,000 from the Enterprise Foundation to continue its work. 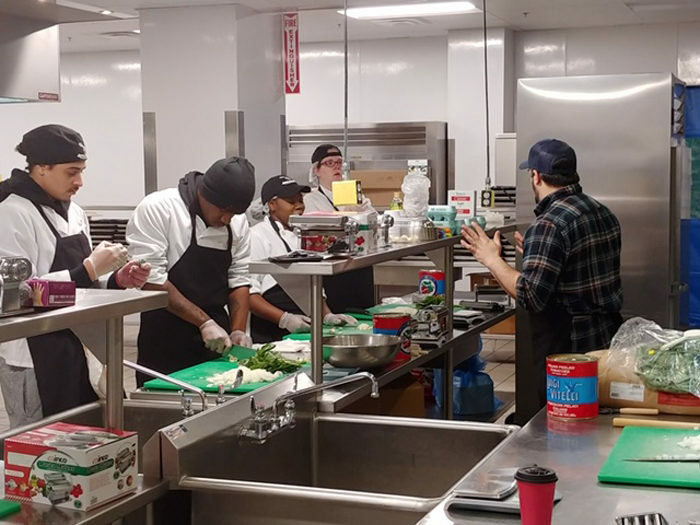 While the kitchen employees direct the fellows in the art of cooking, Scannell and Clayton Waller, the program’s career coach, teach workplace readiness skills. Both were hired specifically for the culinary training program. “Instead of focusing on deficits, we have them look at the big and small events in their lives and how they grew from them,” says Scannell. In addition to traditional skills—goal setting, resume writing, and interviewing—students learn how to get to work on time every day, stay motivated, and peacefully resolve work conflicts. And if a fellow’s personal life starts to fray, Scannell and Waller are quick to step in—“wrapping a client in support,” they say. They helped a young woman find alternate means to pay for daycare after her partner left town, referred students for legal advice and mental health counseling, and smoothed out tenant-landlord disputes. The Rochester program’s experience is not unusual, says Renee Martin, director of Catalyst Kitchens. The annual attrition rate for Catalyst’s national network of culinary programs is between 30 and 40 percent. Foodlink conducted a “rigorous assessment” of its applicants during the selection process and will continue to tweak the program, says Gruber. But staff acknowledge the needs of the students have been more intensive than anticipated. That’s one reason why Foodlink has decided to train two groups of students a year, rather than the four groups they’d initially planned. “We would rather spend more time with each cohort to ensure that we are setting people up for long-term success in the food industry,” Gruber says. Money was another factor in the decision to grow the program more slowly than planned. “Though we eventually expect to have employer-sponsors to make the program sustainable, we know that right now we need to find ways to make the Fellowship financially viable,” Gruber adds. LaRhonda Harris, a 28-year-old single mother of three, is one of the students who has blossomed in the program, in part thanks to the caring of Scannell and Waller. On one occasion, Waller accompanied Harris to a parent-teacher conference. “We wanted to make sure she had an advocate,” he explains. After the teacher informed Harris that her son was way behind in class, Scannell bought the child flash cards and books. Update: This post has been updated to reflect the current number of members of Catalyst Kitchens. Awesome, awesome read!!! I love what they are doing!!!! Would you be able to provide contact information of the founders? I would love to speak with them!